ISDP Forum: The China-Pakistan Economic Corridor – Stirring Tensions or Spurring Development? When the China-Pakistan Economic Corridor (CPEC) was launched in 2015 it was hailed both as positive step in relations with China and as a cure to Pakistan’s economic woes. With loans, grants and investments that might rise to $60 billion, the infrastucture and industrial projects that make up CPEC are sure to affect Pakistan on numerous political and social levels. In this ISDP Forum, Marvi Memon, former Federal Minister and Chairperson of the Benazir Income Support Program (BISP), will deliver a presentation on CPEC and its political and social impact on Pakistan. 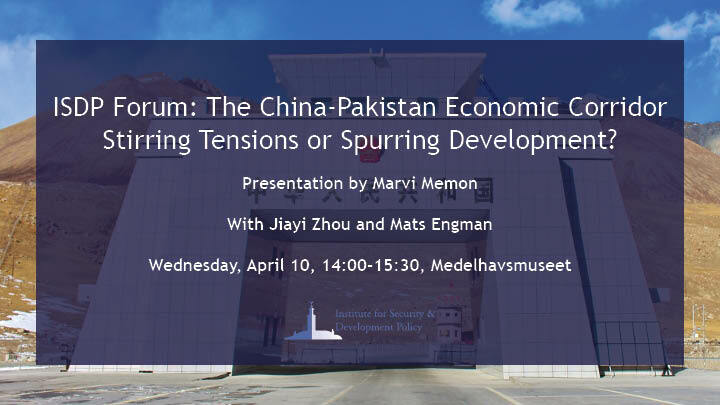 Jiayi Zhou, Researcher with the Stockholm International Peace Research Institute’s Climate Change and Risk Programme, will give remarks on Ms Memon’s presentation. The presentation will be followed by a panel discussion and Q&A session with the audience.